Hi friends. I'm back from Australia aka the Land Down Under aka Oz aka Th'underside aka Koalaville aka The Big Apple. Had a damn good time and saw some damn good birds. 202 species, in fact. All self-found and identified (which means lots of misidentifications, probably). Do you want to hear about them? What's that? You're sitting at a computer and have no way of answering? Well, looks like I've got you, then. You're just gonna have to sit there and look at these words and pictures. As I sometimes (Florida) do (Texas) when I have a lot of info to share but remember that I'm lazy, I'll be presenting my trip as a set of Top Fives. Let's get down under. 5. uhh okay honestly I don't think we saw five. Sorry to start slow here. There are a ton of reptiles in Australia, but we weren't really looking for them and only saw what we could, during the day. 4. Snake tails. 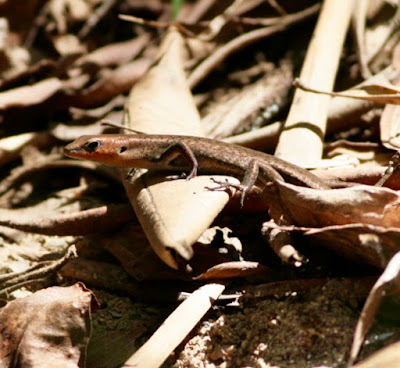 I saw just one snake the whole time, the small yellow tail of one creeping off into the leaf litter on Long Island in the Whitsundays. No idea what it was. Liz saw another tail in Mossman. This is boring I shouldn't have started with reptiles. 2. Crocodiles. Australia is famous for its crocodiles, and rightfully so. They're huge and scary and eat people a lot more frequently than is comfortable. It was interesting, between giant saltwater crocodiles and deadly summertime jellyfish collectively called "marine stingers," the perfect white sand beaches from Cairns north are completely devoid of swimmers and surfers. 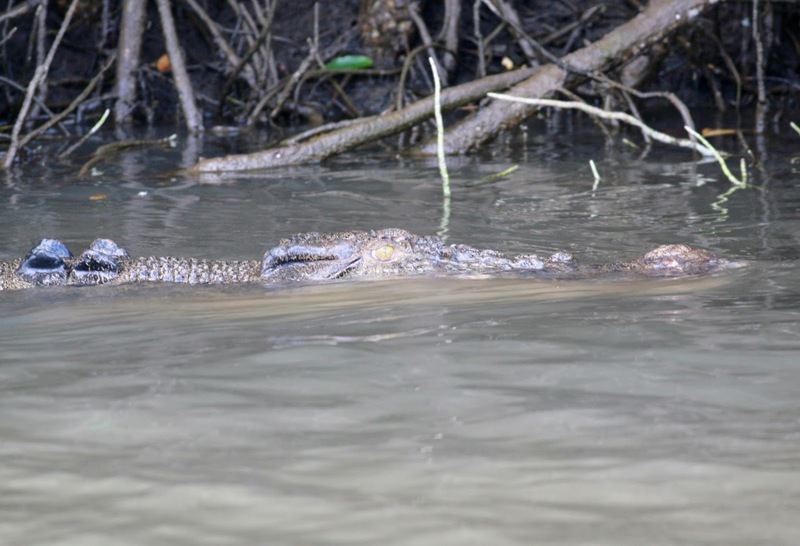 It's eerie, but it's better to stay dry than to be eaten up by a bloody great crocodile. The crocs were huge but...crocodiles are boring. They're boring. They just sit there or swim lazily around. I didn't see them feed on anything, which would have been amazing, so these lizards are just at #2. 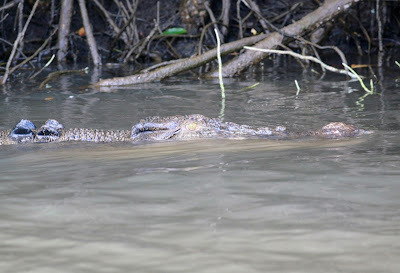 The top photo here is a male swimming in the Daintree River. He's huge, and could easily kill a human. The bottom photo is a smaller female, also on the Daintree. 1. Goanna. Yeaaahhh this guy was intense. 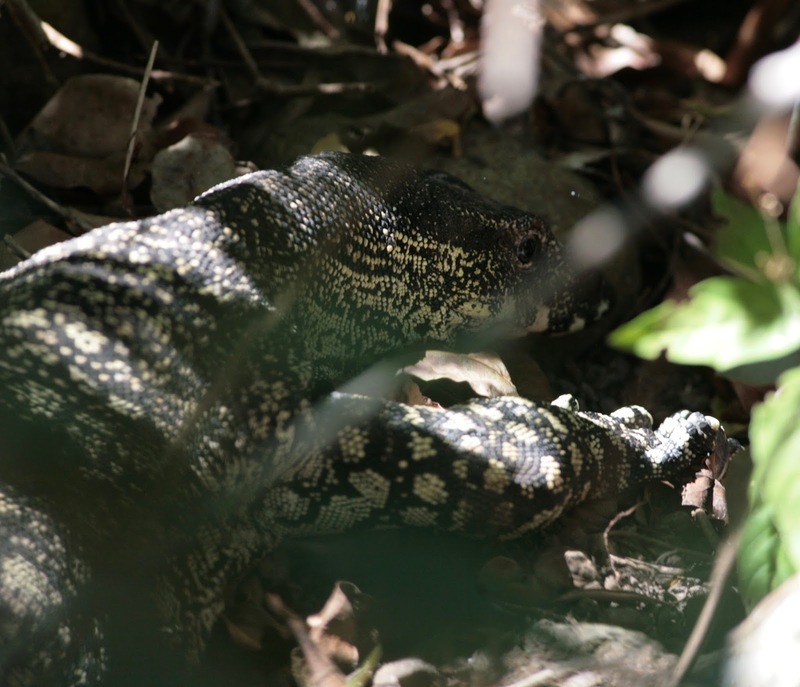 I was talking a stroll alone down a path on Long Island, a little eco-resort we stayed at on the Whitsundays, when this massive lizard slowly crossed the path in front of me. I swear it was five feet long, a frigging Komodo dragon. People down there see monitor lizards, called Goannas, all the time but it was new to me, and intense. It didn't look threatening at all, but I didn't push my luck. It was so close and in the leaves that I couldn't really get a good picture, sorry. 5. I cooked little beef burritos on the back of our camper van one night in Kakadu. They were mediocre, but it always tastes better when you cook for yourself. 4. Silky Oaks Lodge. This eco-lodge in Mossman was the fanciest and nicest place we stayed at. Our room was fantastic, and the dinner was pretty good too. I had fish, I think. 3. Opera Bar, Sydney Opera House. We had just a few hours total in Sydney, and decided to head down to the Opera House because, I mean, it's the most beautiful building I've ever seen. It really lived up to all the hype. We ate at the lively self-order restaurant bar along the lower deck of the structure, fighting off Silver Gulls and our own giddiness. 2. 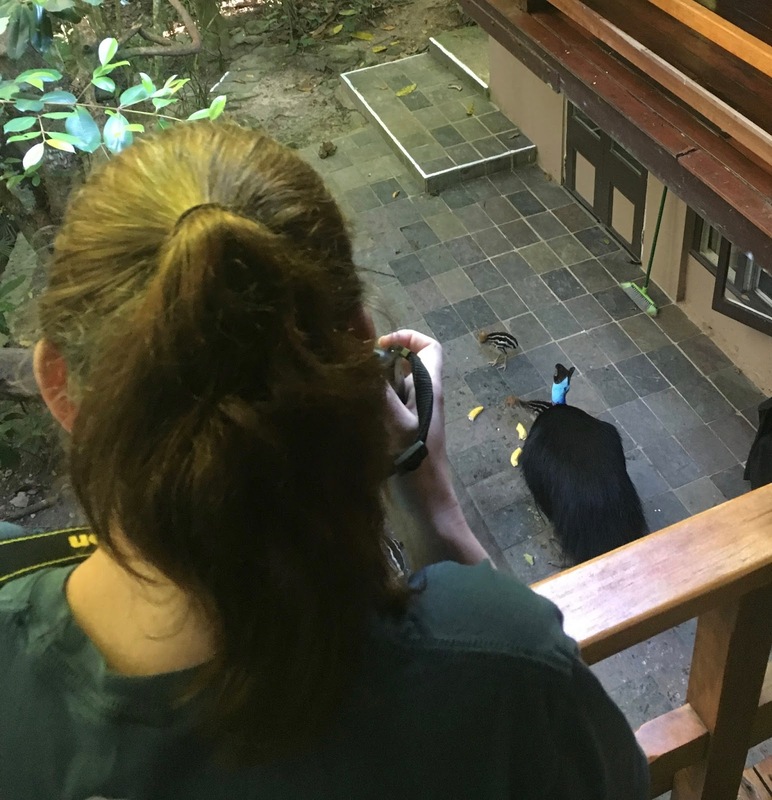 Breakfast at Cassowary House. We spent two nights at this little eco-lodge in the rainforest near Cairns. The accommodations were fairly bare-bones, but the atmosphere was amazing. Southern Cassowaries visited the front porch of the main house both mornings. I watched a Victoria's Riflebird -- a type of bird-of-paradise -- practice its display both mornings from my little balcony. We paid a little extra for breakfasts each morning and we were so glad we did. It was unfussy fare, just fruit, bread, yogurt, etc., but it was incredibly tasty and heightened by cassowaries, Spotted Catbirds, Musky Rat Kangaroos and other birds all around us. Great mornings. 1. The Balcony, in Townsville, QLD. This place was awesome. I got black bread and chorizo for brunch, and Liz got eggs benedict. Was the best food we had. 202. Sulphur-crested Cockatoo. It was awesome to have Sulphur-crested Cockatoo around. Incredible. They're stunning, almost caricatures of the idea of a tropical bird. One morning in the Whitsundays while I was drinking coffee from a hammock (!) one landed about three feet from me and just sat for five minutes. It was incredible. 5. Wompoo Fruit-dove. A pleasant sort of wobbly croak I heard a couple mornings in the rainforest. 4. 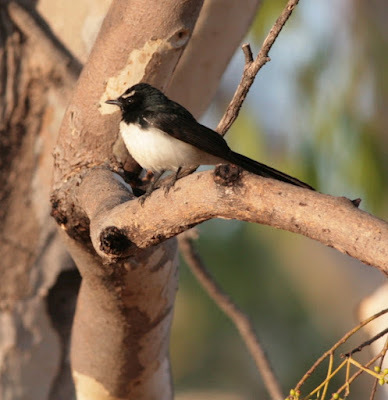 Willie-wagtail. These were maybe my favorite birds of the entire trip. Imagine an Eastern Phoebe that's starker black-and-white instead of dusky gray, and instead of cutely pumping its tail it adorably shakes its little booty back and forth. They're delightful, and their squeaky little call is delightful too. 3. Double-eyed Fig Parrot. I am terrible with bird sounds, but was proud of myself for connecting the metallic "tink!" I kept hearing to this snazzy little green bullet. It's a proud moment when you begin to recognize a species just by ear, and this was my first in Oz. 1. Eastern Whipbird. Oh man. I think David Attenborough used this call in the background of some of his Life of Birds shows, or some of the BBC shows. I never knew what it was (and am now wondering if the song was improperly used in non-Australian jungles), so I was overjoyed to hear it throughout the Cairns area. Such a cool "boooooooooooWHIP!" song, louder than expected and pretty startling when they're close.